"People got dead up there for real!" 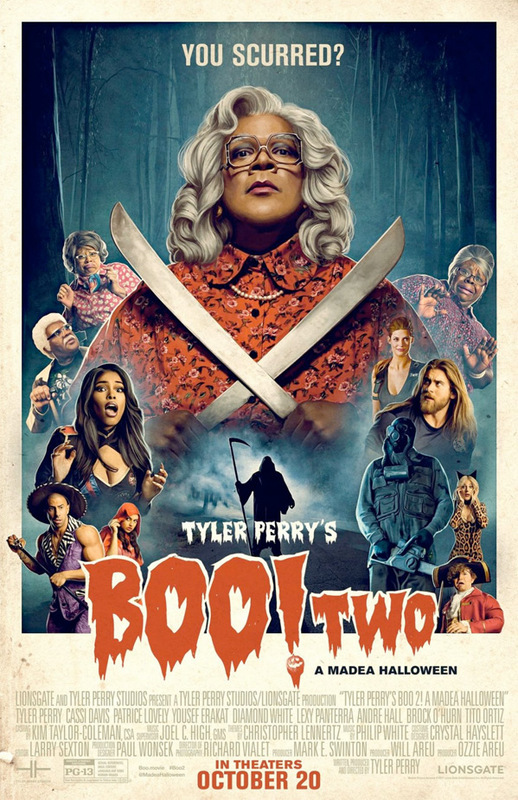 Oh boy, here we go again… Lionsgate has revealed the trailer for the newest Tyler Perry joint, another Madea comedy (sequel) titled Boo 2! A Madea Halloween. This is, obviously enough, a sequel to the goofy Halloween comedy Boo! A Madea Halloween release just last year. Tyler Perry not only returns to write and direct, but also star again as Madea (and Joe and Brian). The cast includes Cassi Davis, Patrice Lovely, Chandra Currelley, Yousef Erakat, Diamond White, Lexy Panterra, and Andre Hall. The plot involves Madea, Bam & Hattie going to a haunted campground where they find monsters, goblins, and the boogeyman. As much as I have absolutely no interest in these movies, I have to give them props on the amusing poster design. Other than that, if you want to watch then go ahead. Madea and the gang are back (once again) for this hilarious sequel. Madea, Bam and Hattie venture to a haunted campground and the group must literally run for their lives when monsters, goblins and the bogeyman are unleashed. Boo 2! A Madea Halloween is again written and directed by the multi-talented filmmaker/actor Tyler Perry, director of Madea's Family Reunion, Why Did I Get Married?, Meet the Browns, The Family That Preys, Madea Goes to Jail, For Colored Girls, Madea's Big Happy Family, Good Deeds, Madea's Witness Protection, A Madea Christmas, The Single Moms Club, as well as Boo! A Madea Halloween previously. Lionsgate will release Tyler Perry's Boo 2! A Madea Halloween in theaters starting October 20th this fall, just in time for Halloween the next weekend. If this scares you. Anyone interested?